Recently, it has been revealed that visible light activates the endogenous porphyrins of P. acnes, which results in bacterial death due to photodynamic reactions. The absorption peak of bacterial porphyrins is at 415 nm, which falls into the blue light waveband. The wavelength of blue light that is effective in treatment of acne is between 405 and 470 nm. This is near the aurones' absorption wavelength (390–430 nm)., Therefore, it seems that simultaneous application of blue light exposure and the aurones could result in synergistic effects in their antibacterial effects. Hence, we prepared a topical gel formulation containing the A. majus extracts and evaluated its anti-P. acne antibacterial effects with or without simultaneous exposure to blue light, to search whether this combination shows a better antiacne effect or not. A. majus was collected from the Flowers Garden of Isfahan in June 2014. The specimens were identified and the plant herbarium was kept in the Department of Pharmacognosy of Isfahan School of Pharmacy with the voucher No. 3319. The plant samples were dried in darkness and under ventilated hot air at 40°C to avoid destruction of main constituents. After drying, the obtained materials were subjected to determine the water content by loss on drying for being <2%. The dry powder crushed in blender (Hardstone)™, passed through meshes No. 14, and kept in air tight containers before use. The selected specimen was extracted by refluxing with 90% ethanol and concentrated under reduced pressure. It has been kept in freezer for 24 h before further study. To determine the extract density, about 1 ml of hydroalcoholic extract put on oven at 100°C until completely dried. This powder was weighed and considered as the petal or shoot density of extract. Standardization of the extracts has been performed on the basis of their phenolic contents using the Folin–Ciocalteu method. To evaluate the antibacterial activity of the extracts, P. acnes (PTCC 6916) was obtained from Pasteur Institute of Iran (Tehran, Iran) and cultivated on brain–heart infusion (BHI) medium (Merck, Germany) supplemented with 1% glucose (BHI-Glu) and in an anaerobic jar. Organoleptic parameters and skin irritation test were performed on a group of volunteer women between 18 and 30 years, randomly chosen, and after informed consent, they were asked to use final formulation on their arm and let it remain for 24 h, and then, they gave their comments about the formulation. The organoleptic parameters were also checked by the following methods. pH of the prepared formulations was measured using a digital pH meter (Metrohm Switzerland) at room temperature in natural condition. After calibration, the determinations were carried out in triplicate and the average was calculated. The viscosity of formulated gels was determined using Brookfield viscometer at 50 rpm and 25°C. To evaluate the effect of blue light on antibacterial activity of A. majus extract alone or when gel formulated, various plate combinations were designed in duplicate, one as a sample exposing to blue light, and one control nonblue light exposing plate. According to the previously obtained MIC values for the free plant extracts, the similar concentrations of the plant extract were added into 50 mg of gel base, separately. The blue light effect on these gels has been determined from a 25-cm distance for 30 min. SPSS Windows version 19 (SPSS Inc., USA) was used for statistical analyses by applying mean values using analysis of variance (ANOVA) with proper post hoc test. P < 0.05 was considered statistically significant. The Rf value of about 4.2 for the A. majus extract showed the presence of aurones. In spectrophotometric identification of the extract, on the other hand, it was showed two significant bands at 260 and 406 nm, confirmed the release of extract from the plant. Average density of plant was 0.09 g/ml for shoots and 0.05 g/ml for petals. Total phenolic content of the extract showed to be 4.065 ± 0.014 (g of gallic acid/g of ethanolic extract). 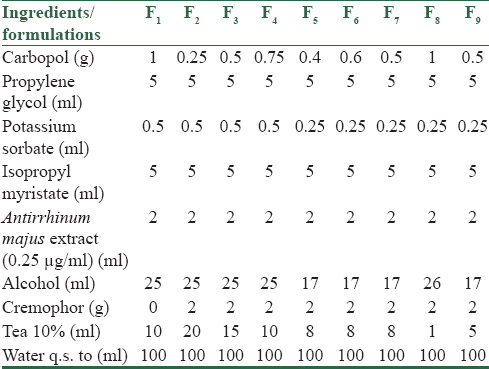 Nine gel formulations were prepared based on the obtained results from the Experimental Design™ software [Table 1]. The pH of most formulations ranged from 6.8 to 7.1, which was acceptable for topical formulations. Finally, the formulation F9 has been chosen for its desirable pharmaceutical properties. This formulation was translucent, produced smooth effect on skin, left nothing on skin, and showed good consistency and homogeneity [Table 2]. According to the results of ANOVA test, it was shown that there were no significant differences between the formulated and gel in the market in terms of spreadability [Table 3]. Analyzing of the data of pH in different times (1, 7, 30, and 120 days after the formulation) using ANOVA and Tukey post hoc test showed no significant changing in pH in comparison to the fresh formulation over the time (P < 0.05) [Table 4]. ANOVA and Tukey post hoc test showed no statistically significant reduction in terms of drug content, except after 3 months of formulation preparation at room temperature and normal condition (P = 0.035) [Table 5]. 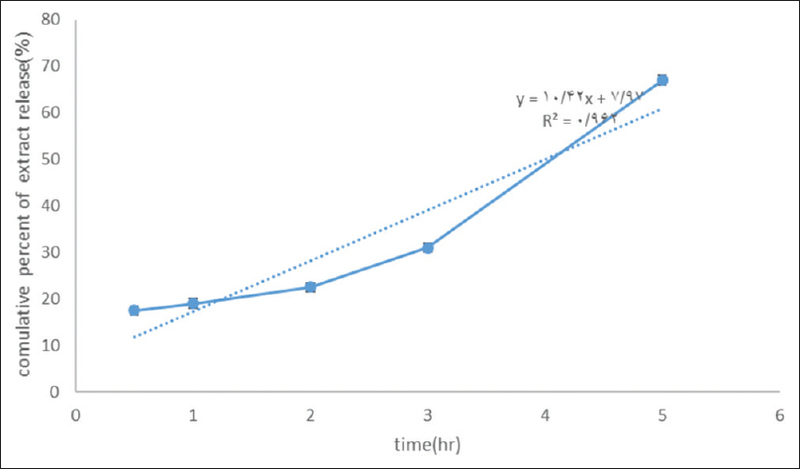 According to [Figure 1], after the analysis of the extract release using UV spectrophotometer at 410 nm, at time intervals of 15, 30, 60, 120, and 180 min and 5 h, it was concluded that the most extract release from the membrane occurred after 5 h as 60.07% [Figure 1]. 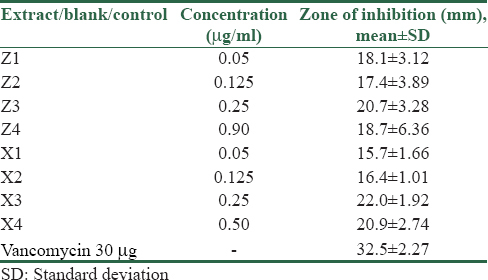 For both petal and shoot extracts formulated as gel, there were no significant differences between the zone of inhibition of gel with or without blue light combination from a 25-cm distance for 30 min in all final extract concentration (P < 0.05) [Table 6]. ANOVA and Tukey test, on the other hand, showed that there were no statistically significant differences between the effectiveness of the gel containing shoot or petal extract with or without light (P > 0.05) [Table 6]. Finally, the antibacterial effects of formulated gel and intact petal or shoot extract showed no statistical significant differences, so it is concluded that the formulation of the gel has no negative effects on the antibacterial activity of the A. majus extract [Table 6]. Antimicrobial and antifungal properties of Snapdragon referred to aurones absorb wavelength between 240–270 and 390–430 nm, respectively, according to the study of Cerovic et al. Jardosh and Patel. evaluated the antibacterial effects of synthetic aurones and reported significant antibacterial effects against S. aureus, B. subtilis, C. tetani, E coli, P. aeruginosa, and Vibrio cholera as well as antifungal effects against C. albicans and A. clavatus. In addition, Riaz et al. approved the antibacterial and antifungal effect of Snapdragon extract against Pasteurella multocida, Escherichia coli, B. subtilis, Aspergillus flavus, Aspergillus niger, Alternaria alternata, and Rhizopus solani. In other studies, significant antimalaria, antimicrobial, antifungal, antivirus, anti-inflammatory, anticancer, and antiangiogenesis effects have been reported for aurones. Furthermore, the effects of some aurones in the treatment of skin pigmentation by inhibiting tyrosinase in the synthesis of melanin were reported. According to Jardosh and Patel. results, the MIC of aurones for S. aureus, B. subtilis, and C. tetani has been calculated as 12.5, 25, and 50 μg/ml, respectively. However, in our study, the estimated MIC of aurones in the shoot and petals was about 0.25 μg/ml. This higher antibacterial effects can be attributed to the higher sensitivity of P. acnea to the aurones in comparison to the investigated Gram-positive bacteria in the Jardosh and Patel study. Carbopol is one of the most ingredients used as the gel bases for the production of antiacne gels. In one study, this compound was used for the preparation a polyherbal antiacne gel, and the results showed that this gel had good consistency and spreadability. Another study is the Mayank et al. 's project successfully used this polymer for the formulation a herbal antiacne gel-containing Aloe vera extract with suitable appearance, color, consistency, pH, and spreadability. Moreover, this component did not interfere with the antimicrobial effect of final formulation, and the antiacne effects of the formulated gel were equal to the intact extract. At the end of the study, we evaluated, for the first time, the effect of the blue light exposure on potentiating the antibacterial effect of the prepared gel formulation. While it was showed that the combination of A. majus gel with the blue light did not show any additive or synergistic effects in our study, according to Tzung et al. 's study, clinical application of blue light twice a week for 4 weeks from 15 cm distance with the power of 40 J/cm 2 is useful. In another study, Dai et al. radiated blue light from 25 cm for 60 min on the microbial suspension, which reduced bacterial count by 15%–24%., Furthermore, Ashkenazi et al. radiated blue light for 24 h from a distance of 10 cm to test tubes with the energy of 75 J/cm 2. Then, the results have been checked by electron microscopy and showed that the walls of many bacteria had been destroyed. In the present study, we prepared a topical gel formulation containing hydroalcoholic extracts of A. majus. It showed significant antibacterial effects against P. acnes. We also evaluated the effect of blue light exposure on its effectiveness on the observed antibacterial effects. However, it did not show any enhancement on the observed effects. In this regard, further clinical studies for the evaluation of the healing effects of the prepared gel formulation on acne lesions must be performed. Authors are grateful to thanks Mrs. Shafizadegan for her technical supports on antimicrobial tests. This work has been financially supported by Isfahan University of Medical Sciences as a Pharm. D. Thesis with grant number 393274. Vats A, Sharma P. Formulation and evaluation of topical antiacne formulation of coriander oil. Int J Pharm Pharm Sci Res 2012;2:61-6. Webster GF, Rawlings AV. Acne and Its Therapy. United States, Boca Raton, Florida: CRC Press; 2014. Sandhya S, Sravanthi EV, Vinod K. Evaluation of a dermatological herbal hydrogel integrated with Ipomea pes-tigridis for anti acne activity. Inflammation 2013;1:5. Sawarkar H, Khadabadi S, Mankar D, Farooqui I, Jagtap N. Development and biological evaluation of herbal anti-acne gel. Int J PharmTech Res 2010;2:2028-31. Zu Y, Yu H, Liang L, Fu Y, Efferth T, Liu X, et al. Activities of ten essential oils towards Propionibacterium acnes and PC-3, A-549 and MCF-7 cancer cells. Molecules 2010;15:3200-10. Ashkenazi H, Malik Z, Harth Y, Nitzan Y. Eradication of Propionibacterium acnes by its endogenic porphyrins after illumination with high intensity blue light. FEMS Immunol Med Microbiol 2003;35:17-24. Leal-Silva H, Padilla B, Verduzco R, Salas J. Efficacy and Safety of a New Treatment Modality: The ClearLight™ PhotoClearing System; 2002. Harborne J. Plant polyphenols. X. Flavone and aurone glycosides of Antirrhinum. Phytochemistry 1963;2:327-34. Marinova K, Kleinschmidt K, Weissenböck G, Klein M. Flavonoid biosynthesis in barley primary leaves requires the presence of the vacuole and controls the activity of vacuolar flavonoid transport. Plant Physiol 2007;144:432-44. Ramadan MF, El-Shamy H. Snapdragon (Antirrhinum majus) seed oil: Characterization of fatty acids, bioactive lipids and radical scavenging potential. Ind Crops Prod 2013;42:373-9. Bandgar BP, Patil SA, Korbad BL, Biradar SC, Nile SN, Khobragade CN, et al. Synthesis and biological evaluation of a novel series of 2,2-bisaminomethylated aurone analogues as anti-inflammatory and antimicrobial agents. Eur J Med Chem 2010;45:3223-7. Jardosh HH, Patel MP. Antimicrobial and antioxidant evaluation of new quinolone based aurone analogs. Arabian J Chem 2014;S3781-S3791. Lee SY, You CE, Park MY. Blue and red light combination LED phototherapy for acne vulgaris in patients with skin phototype IV. Lasers Surg Med 2007;39:180-8. Cerovic Z, Ounis A, Cartelat A, Latouche G, Goulas Y, Meyer S, et al. The use of chlorophyll fluorescence excitation spectra for the non-destructive in situ assessment of UV-absorbing compounds in leaves. Plant Cell Environ 2002;25:1663-76. Bloor SJ. Overview of methods for analysis and identification of flavonoids. Methods Enzymol 2001;335:3-14. Markham KR. Techniques of Flavonoid Identification. London: Academic Press; 1982. Wollenweber E, Harborne J, Mabry T. In: Harbone JB, Mabry TJ, editors. The Flavonoids: Advances in Research. London: Chapman and Hall; 1982. p. 240. Rop O, Mlcek J, Jurikova T, Neugebauerova J, Vabkova J. Edible flowers – A new promising source of mineral elements in human nutrition. Molecules 2012;17:6672-83. Gübelin W, Martínez MA, Molina MT, Zapata S, Valenzuela ME. Antimicrobial susceptibility of strains of Propionibacterium acnes isolated from inflammatory acne. Rev Latinoam Microbiol 2006;48:14-6. Nayak N, Verma L, Satpathy G, Venkatesh P. Propionibacterium acnes endophthalmitis. J Clin Diagn Res 2007;3:155-8. Zandi S, Vares B, Abdollahi H. Determination of microbial agents of acne vulgaris and Propionibacterium acnes antibiotic resistance in patients referred to dermatology clinics in Kerman, Iran. Jundishapur J Microbiol 2011;4:17-22. Chaurasiya N, Chakraborthy G. Formulation and evaluation of herbal hydro gel from Hibiscus rosa-sinensis. Int J Curr Pharm Res 2014;6:14-6. Dwivedi S, Gupta S. Formulation and evaluation of herbal gel containing Sesbania grandiflora (L.) poir. Leaf extract. Acta Chim Pharm Indica 2012;2:54-9. Singla V, Saini S, Joshi B, Rana A. Emulgel: A new platform for topical drug delivery. Int J Pharma Bio Sci 2012;3:485-98. Das MK, Ahmed AB. Formulation and ex vivo evaluation of rofecoxib gel for topical application. Acta Pol Pharm 2007;64:461-7. Pawar DP, Shamkuwar PB. Formulation and evaluation of herbal gel containing Lantana camara leaves extract. Asian J Pharm Clin Res 2013;6:122-4. Basha BN, Prakasam K, Goli D. Formulation and evaluation of gel containing fluconazole-antifungal agent. Int J Drug Dev Res 2011;3(4):109-128. Singhvi G, Singh M. Review: In-vitro drug release characterization models. Int J Pharm Stud Res 2011;2:77-84. Chime S, Onunkwo G, Onyishi I. Kinetics and mechanisms of drug release from swellable and non swellable matrices: A review. Res J Pharm Biol Chem Sci 2013;4:97-103. Riaz M, Rasool N, Rasool S, Rashid U, Bukhari IH, Zubair M, et al. Chemical analysis, cytotoxicity and antimicrobial studies by snapdragon: A medicinal plant. Asian J Chem 2013;25:5479. Zwergel C, Gaascht F, Valente S, Diederich M, Bagrel D, Kirsch G, et al. Aurones: Interesting natural and synthetic compounds with emerging biological potential. Nat Prod Commun 2012;7:389-94. Rasheed A, Avinash Kumar Reddy G, Mohanalakshmi S, Ashok Kumar CK. Formulation and comparative evaluation of poly herbal anti-acne face wash gels. Pharm Biol 2011;49:771-4. Mayank S, Vikas R. Formulation development and evaluation of novel poly-herbal anti-acne gel. Int J Pharm Tech Res 2014;6:58-62. Dai T, Gupta A, Murray CK, Vrahas MS, Tegos GP, Hamblin MR, et al. Blue light for infectious diseases: Propionibacterium acnes, Helicobacter pylori, and beyond? Drug Resist Updat 2012;15:223-36. Tzung TY, Wu KH, Huang ML. Blue light phototherapy in the treatment of acne. Photodermatol Photoimmunol Photomed 2004;20:266-9.